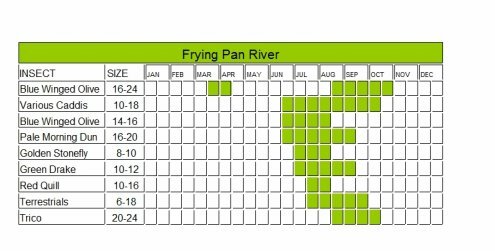 The Frying Pan River is one of the best fly-fishing rivers in America. The river starts just east of Aspen Colorado and flows towards the Ruedi Reservoir. When it leaves the reservoir it flows 14 miles where it finally meets up with Roaring Fork River at Basalt. It is this stretch of river that makes the Frying Pan a fly fisherman’ favorite. The tail waters just below the dam are where you will find the “monster” fish. The fishing gets pretty crowded in this area with everyone trying to land the big fish. Don’t worry about the crowds because there is plenty of fishing access the next 14 miles below the dam. You will want to check the fishing regulations for this river and pay attention to the private property throughout the resort town of Aspen. 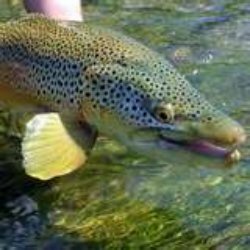 The river is loaded with Brown Trout, but you will also find Rainbow, Cutthroat and Brook Trout. This river also provides year round fishing, so if you want to take a break from skiing be sure to bring your fly rod with you. This stream gets more than its share of fisherman so there is a lot of pressure on the fish. Be sure to bring your best skills to the river because you will need them if you want to land the “monster” fish. Be sure to bring your Mysis shrimp along with BWO, Pheasant Tails, Midges, Brassies, and Adams. Be sure to stop into a local Fly Shop and find out what is working best the time you are there. The Fly Shop owner or employee is your best friend when it comes to attracting fish. Map of the Frying Pan. Leave the Frying Pan River and return to the Colorado page.